Flywheel locking tool – No.Mot.1431. Crankshaft pulley holding tool – No.Mot.1917. Ensure timing marks positioned as shown  . If not, turn crankshaft 360°. Turn lever to unlocked position  . Press plunger into tensioner body  . Turn lever to locked position  . Insert 2,5 mm pin to lock tensioner plunger  . Align 7th tooth of inlet camshaft sprocket with threaded hole in cylinder head  . Count clockwise from camshaft adjuster timing mark. Ensure 7th tooth of inlet camshaft sprocket aligned with threaded hole in cylinder head  . Ensure crankshaft sprocket timing mark at 6 o’clock position  . 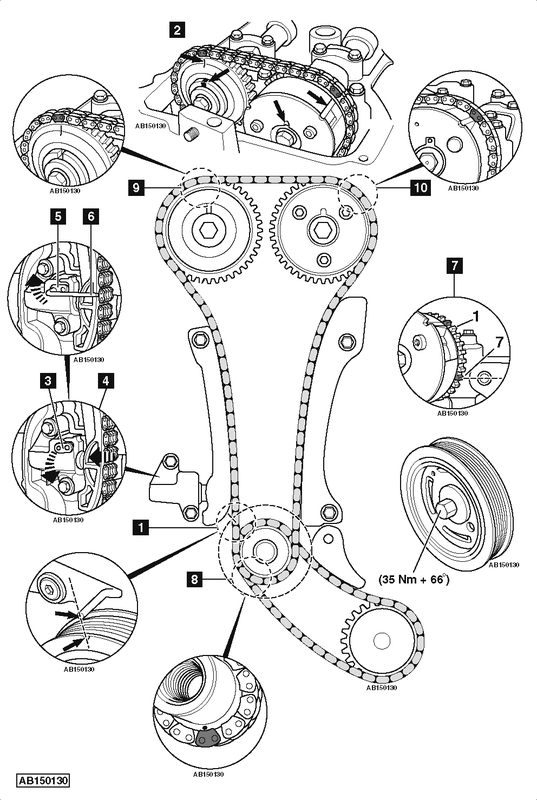 Fit timing chain in anti-clockwise direction, starting at inlet camshaft sprocket. Align marked or coloured chain links with timing mark on each sprocket  ,  &  . Ensure timing marks positioned as shown  .